HAPPY NEW YEAR! We had an exciting holiday season filled with a host of celebrations benefiting Dade Legal Aid clients and their families. Thank you to the many lawyers, firms and associations for sponsoring Dade Legal Aid during this season. Your acts of kindness truly made a substantial difference in our clients’ lives. In 2019, we have exciting and engaging CLE recruitment and substantive seminars, endless pro bono opportunities and new collaborative clinics planned for you. To kick off the New Year, on January 23, we are holding a Probate seminar in conjunction with the DCBA Probate and Guardianship Committee entitled, “You Be the Judge,” featuring various sitting judges and practitioners. On February 1, we are co-sponsoring a Landlord Tenant seminar in conjunction with the DCBA County Court and Real Property Committees entitled, “The ABC’s Meet the XYZ’s of Residential Leasing – How to Avoid Pitfalls.” On March 8, we are holding a Bankruptcy seminar in conjunction with the Bankruptcy Bar Association and the American College of Bankruptcy Foundation. On March 13, we are co-presenting a Legal Screening/ Naturalization training in conjunction with Carlton Fields, AIJ and Catholic Charities on issue spotting techniques targeting pro bono attorneys and firms. We are blessed to work with so many dedicated groups that help to fulfill our mission of providing free holistic civil legal services to the needy. We thank each of our community partners, pro bono attorneys and law firm supporters for your participation: Arts Business Council, Bankruptcy Bar Association, Caribbean Bar Association, Catholic Legal Services, City of Miami Americorps VISTA, DCBA YLS, MDFAWL Florida Association of Women Lawyers, Gwen S. Cherry Bar Association, DCBA Family Law and Immigration Committees, the Guardian ad Litem Program, Haitian Lawyers Association, DCBA Probate & Guardianship Committee, South Miami Kendall Bar Assn., Dade County Defense Bar, Wilkie D.Ferguson, Jr., Bar Assn., and many more. Your vast resources and expertise provide us with much needed valuable guidance and support that strengthens pro bono services in our community and also offers knowledge, assistance, and access to additional resources that enable us to pursue innovative and collaborative approaches to problem solving, making DLA PSB an award winning program! To celebrate our 70th anniversary, we are presenting our 70th client of 2019 with a gift card, recruiting 70 new firms, and hosting a combined 70 events (seminars, clinics and workshops)! On April 13, 2019 we are going to celebrate in style at the Battle of the Legal Bands and again on May 17 at our annual Recognition Luncheon. 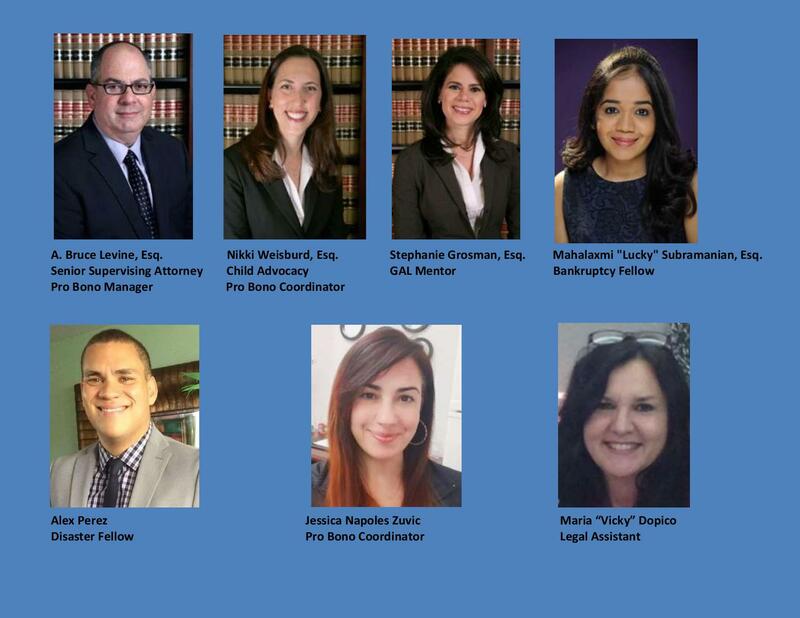 Please contact us if you have any questions or would like to take a case or meet with our dedicated team to learn how you and your firm can be the one to make a meaningful difference in 2019 (305)-579-5733 ext. 2245 or psb@dadelegalaid.org. Thank you for sharing your time, talent and resources! On behalf of everyone at Dade Legal Aid and Put Something Back, thank you for your support and assistance. We look forward to working with you in 2019!